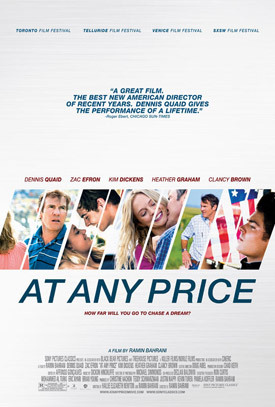 Watch the Movie Trailer for At Any Price. Zac Efron, Dennis Quaid and Heather Graham star in the small-town drama. A farming family’s business is threatened by a high-stakes investigation, further testing the relationship between a father (Quaid) and his rebellious race car driver son (Efron). MPAA Rating: (R) for sexual content including a strong graphic image, and for language. Set in the competitive world of modern agriculture, AT ANY PRICE centers on ambitious Henry Whipple (Dennis Quaid), who wants his rebellious son Dean (Zac Efron) to help expand his family’s farming empire. However, Dean has his sights set on becoming a professional race car driver. When a high-stakes investigation into their business unfolds, father and son are pushed into an unexpected situation that threatens the family’s entire livelihood.